Today marks the 10th anniversary of the Indian Ocean tsunami that devastated the coast of India in 2004. 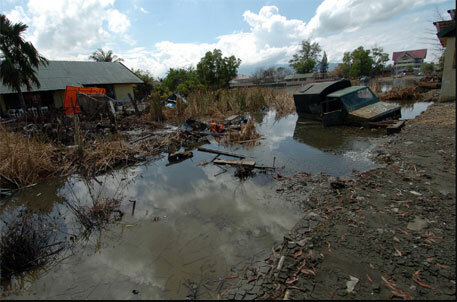 Resulting from the 9.1 magnitude earthquake with its epicentre off the west coast of Sumatra, Indonesia, the tsunami killed about 230,000 people in 14 countries and caused widespread loss of property and livelihoods in the coastal parts of Indonesia, Sri Lanka, India and Thailand, among others. In India alone, nearly 11,000 people were killed and at least 2,750,000 affected. The south-eastern coastline of the country, including Tamil Nadu, Puducherry, Andhra Pradesh and the Andaman and Nicobar islands were the hardest hit. Rescue and relief operations started immediately after the disaster. While grassroots and non-governmental organisations (NGOs) working in the affected areas were the first to reach the victims, the government, too, was quick to facilitate rescue and relief work—the Centre released Rs 700 crore to the affected states and Union Territories through the National Calamity Contingency Fund. Although relief work by NGOs and government agencies continued for two years until 2006-07, rehabilitation efforts since that have been sluggish. According to Ram Subramaniam, coordinator of the NGO Tamil Nadu Tsunami Relief Initiative, there are only one or two agencies still left in the coastal belt of the state providing rehabilitation, while in 2004 there were over 400 NGOs. Most long-term rehabilitation efforts were supposed to have concentrated on better mitigation plans, rebuilding of infrastructure, vulnerability mapping, relocating and rehabilitating displaced families and restoring the coastal ecology. “The government of Tamil Nadu has not wrapped up its long-term rehabilitation projects, even though its relief efforts were commendable. A lot of work is still required in terms of housing, land reclamation and disaster preparedness,” he says. The state government claims otherwise. Speaking on the condition of anonymity, an official from the Tsunami Rehabilitation Programme, a post-2004 initiative of the state, says that necessary rehabilitation initiatives are complete. These projects have received funds worth Rs 5,280 crore from external funding agencies like the World Bank, the Central government as well as states. But the ground reality, as pointed out by Subramaniam, is different. Even 10 years later, people from several coastal towns in Puducherry and Tamil Nadu are waiting to be rehabilitated into new homes. “What was a natural disaster that lasted for a few seconds has now evolved into a man-made disaster. All the fishing hamlets along the East Coast road in Tamil Nadu have disappeared, having been taken over by commercial enterprises like resorts. The government as well as commercial buyers have exploited the trauma of the fishing community in these regions,” says Subramaniam. Subhashini Sridhar, programme coordinator at the Centre for Indian Knowledge Systems that works with farmers in Nagapattinam, Tamil Nadu, says that most of the land reclamation was done by the farmers themselves. “I don’t think the government managed to achieve its long-term objectives. No effort was made to strengthen the coast through natural formations like mangroves or sand dunes. We are still unprepared for a disaster. Every time there is one, it will be followed by funds and work for six months or a year, but two years later we will forget it,” she adds.